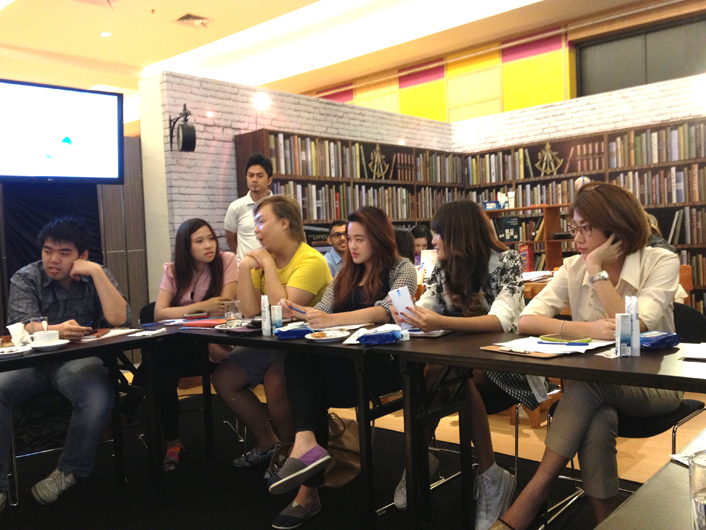 I was invited to Pond's Bloggers Gathering on Tuesday, 20th August, and I was introduced to Pond's new line, which will be launched next month (September 2013), Pond's Acne Complete Solution. I was excited to go to the event, well who wasn't? Acne is like the biggest skin problem of my life, and it's also what I'm still dealing with. No matter how old you are, even you're a man or woman, you deal with acne and acne related problems like oily skin, big pores, whiteheads, blackheads and stuffs. Probably this event was the answer of my prayer to have perfect skin. And because acne is most high school students' problem, and the 'Acne Complete Solution' line is more focusing on teenagers/juvenile's skin problem, the theme of the event was "101 High School', where we can learn how to take care of our skin, how to reduce acne and stuffs! Pond's team was successfully set the area to look like high school, there's canteen, library, classroom, and we were sitting in the medical room, how cool was that? I felt like back to high school. And please excuse the quality of pictures, I left my DSLR camera in my car, and was too lazy to go back to car park, so I use my iPhone camera instead. Some blogger friends who also joined the event with me. Some more blogger friends... And that's the library I was talking about! Cool, eh? Even the speakers dressed like teachers (and medical teacher! 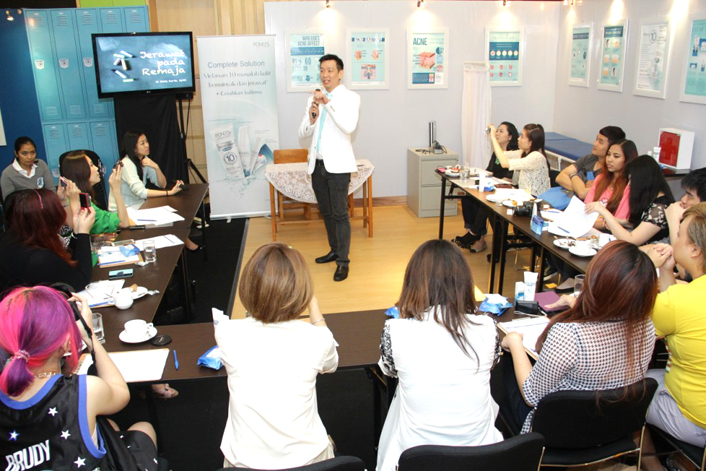 ), there were dr. Eddy Karta SpKK, a skin expert who taught us how to treat our skin, and also the beautiful Ms. Debora Gondokusumo, Pond's Brand Manager who taught us about Acne Complete Solution's goodness. Both of them have amazing skin, I guess they also use Pond's products lol. Everything is in turquoise shades, LOVE!! A cute notebook with some helpful tips in it! Its great to make some notes when you're studying, or you can make some doodles when you're bored in class. At first I thought it was a wallet, but actually its a LOT better, its a compact MIRROR!! 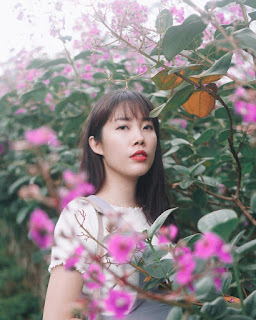 Who says you can look pretty in class, and plus you can eyeing that cute boy who sits across the classroom from the mirror without fear of getting caught. A pretty hand fan. It will become handy when you're out of your comfortable-air-conditioned-classroom, the power outages and stuffs! Pencil, Pen, Peppermints, and Earphones (just in case you're bored, or to listen to music when you're on your way to school or go back home). It is so great that it fights 10 oil & acne problems! Pimple Cover & Care Concealer Pen to instantly cover redness and treats pimples on the go. It is the first ever Pimple Cover & Care Concealer Pen that contains concentrated pimple correction formula which helps to instantly conceal your pimples. It works like the usual concealer, you use it to conceal acne scars, and even pimples which usually red, but it claims to treat pimples also. Its like killing two birds with one stone, eh? Unfortunately, it only has one shade, but they said that they had made a research this shade is the most common skin color in South East Asia. I just hope that they will create more shades for the concealer, because the shade is a little bit darker for my skin tone. with an active known to visibly reduce redness, minimize inflammation and dry up pimples. It works through the night while you sleep, apply it after you wash your face onto your pimples, not to your whole face. Do this once a day at night to reduce redness and dry up the pimples. This might be my favorite from Acne Complete Solution line, use this to remove oil and waterproof make up anytime, anywhere. And the product is available in two size, 7 wipes and 25 wipes. From this event, I also learned that blotting paper is not completely effective to remove oil, its better just to use wipes. And it would be better if you use facial wipes for your face, and not baby wipes or other wet wipes. Its the same rule like not using body wash for your face, your facial skin is more sensitive, and you'll notice how soft this wipes are! Purrrfect! 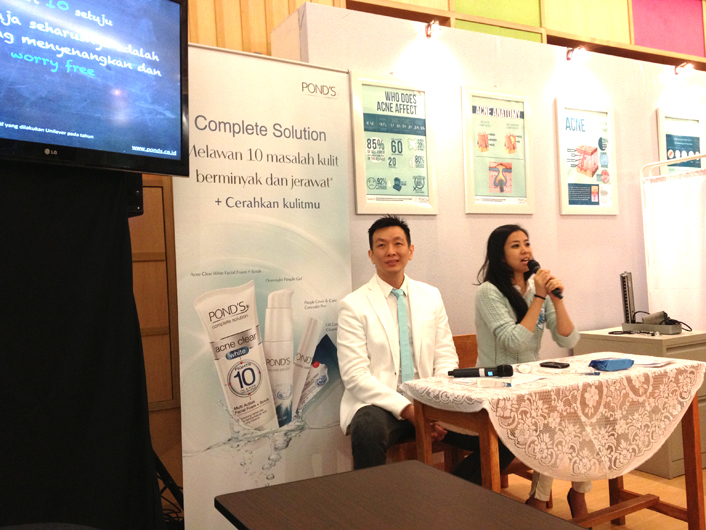 Pond's introduces 3 easy steps so we can have clear skin and worry free about oily skin and acne!  I was impressed with the products. If you do the 3 easy steps regularly, you will get that clear face you've been longing for. But please remember that the products need time to work perfectly on your skin, and your skin also needs time to adapt with the products. Beauty doesn't come in instant way, but you will notice that your skin is so much better day by day. 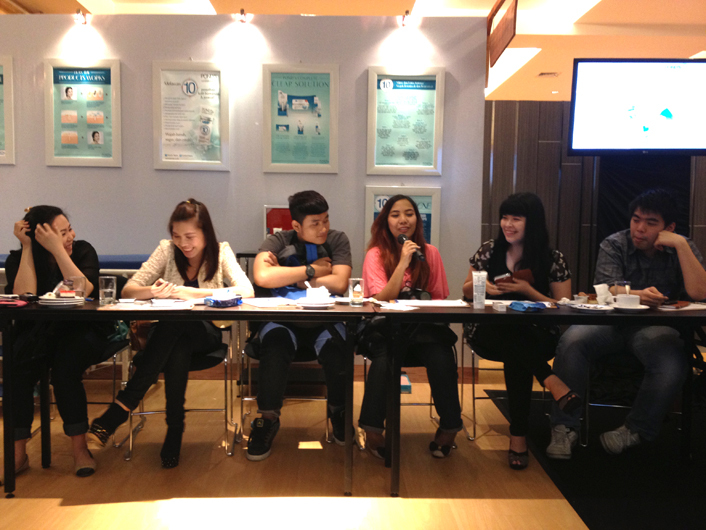 Last pic is a #camho of Pond's team, blogger friends, and I. We had so much fun! aduuuh gak sabar sama concealernyaa. cocok gak say pake ponds acne series ini? so far sih, pemakaian kurang lebih semingguan ya, im impressed with these products..
bahkan pemakaian face cleanser nya aja punya oil control yang luar biasa hehehe..
Wow.. the loots are very nice. I like the color combination. How i wish they would make that kind of give away here too. Do you want to remove acne permanently? Read this Acne No More review to find out how I cure acne permanently and naturally.